Mount Rainier National Park, though open year round, has a paucity of hiking and scramble options owing to limited trailhead access. This installment of Our Secret Rainier offers two winter scramble options. The scrambles we selected - Tum Tum, and Cowlitz Rocks - are climbable year-round (though should be avoided in high avalanche conditions). Both are listed in the Guide to 100 Peaks at Mount Rainier National Park. 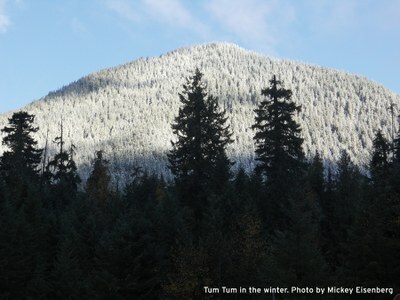 Directions to trailhead: Drive to the Nisqually entrance of Mt. Rainier. Kautz Creek TH is 3.4 miles past the entrance. Park in the parking lot. Good toilets are available at the TH. Route description: Take the Kautz Creek trail to Kautz Creek and continue on the trail for approximately another 1/2 mile. At approximately 3080’ (where the trail goes through a large cut log) leave the trail and head due west (compass bearing 270 degrees) toward a saddle at 3600’. If you can’t find the cut log it is okay to leave at any point around 3080’. Once you leave the trail there is a minor amount of traversing and there may be a few patches of devil’s club. Stay on the compass bearing since the saddle is not very visible until you are on it. At the saddle (3600’) head up the ridge (heading in a SW direction) to the summit. The entire way is wooded. There are only peak-a-boo views from the summit. Note that the dotted-line trail beyond Kautz Creek has since been relocated to the west (shown in red). 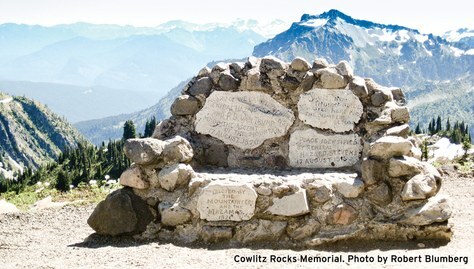 Cowlitz Rocks is located near Paradise and is not to be confused with the Cowlitz Chimneys. Cowlitz Rocks is an easy scramble that goes to a seldom-visited part of the park. It has spectacular views of Little Tahoma and the Cowlitz Glacier. This is a four-season destination, as avalanche risk is usually small. Directions to trailhead: During winter, drive from the Nisqually entrance to Paradise and park in the Paradise Visitor Center on the eastern side. (note: the road is often gated at Longmire and may not open until 10 am.) From the Paradise parking lot, walk or snowshoe the road for approximately 0.8 miles. Just after crossing the Paradise River Bridge, turn uphill in a northwesterly direction. In summer, you can drive past the Paradise Visitor Center and park in a lot just beyond the bridge over the Paradise River, on the right side of the road. 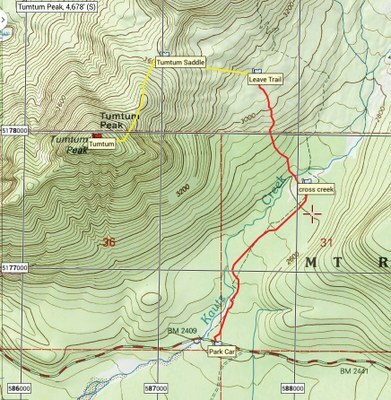 Route description: The trailhead is located by a red “Wrong Way” sign on the east side of the road. Hike the 4th Crossing Trail for 0.2 mile until you reach the Skyline Trail, where you turn right (the sign points to Paradise Glacier, 1 mile). Continue on the Skyline Trail until you reach the Stevens–Van Trump Monument. Fifty yards beyond the monument, follow the trail to Paradise Glacier (the sign states that the trail “ends 1.5 miles ahead”). 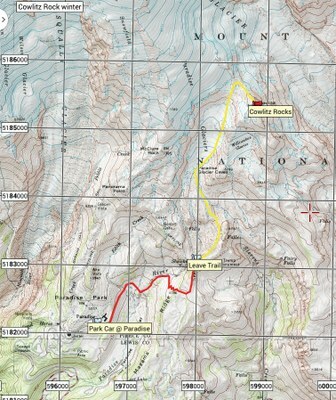 Stay on this trail until it peters out, and then continue northerly with the Paradise Glacier on the left. Head up what appears to be a valley until you reach a col at 7200’, northwest of Cowlitz Rocks. Take the ridge (staying to the right, just off the ridge), and head southeast until you reach the highest point of Cowlitz Rocks (7450’). This final ridge portion of the route goes over rock scree. Caution: Good compass (or GPS skills) are needed as the trails will be obscured by snow. Caution is urged following a very heavy snowfall or if conditions make for high avalanche risk. Best season: All year. Avoid during high avalanche risk. This article originally appeared in our January/February 2015 issue of Mountaineer magazine. To view the original article in magazine form and read more stories from our publication, click here.